1. Cut a circular piece of 8cm diameter (=4cm radius) in any color double shed duplex paper. 2. Make it 4 folds and give zigzag shape to the open ends as shown. 3. Unfold the paper into two and give uniform cuts, 2cm in depth around the circular piece. 4. Now make it four fold, take the wire and fold the tip to make knot, insert the knot from the centre of the piece like this. 5. Now make it into 8 fold, tie at the bottom and give 1cm deep cuts to the zigzag portion of the petal. 6. 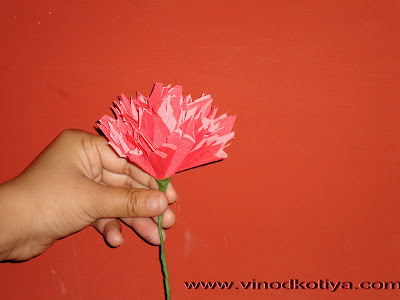 Wrap the green tape on the stem wire at the bottom of the petal and similarly make 5 more petals. 7. Your carnation flowers are ready. 8. Take all petals and twist all the stem wires together. 9. With the use of Green duplex paper make leaves.